Please note that these pages were produced in 1998, and are therefore very possibly out of date. We post them only as legacy pages, with no guarantees. and some intrinsic thoughts about conserving our maritime heritage. South Bay has always been a safe haven for sailing ships when Lake Ontario "blows up". 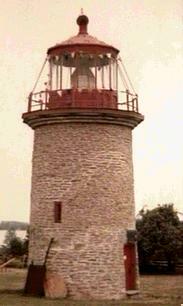 It was therefore fitting that, here at the Museum site in 1967, the top of the False Duck Lighthouse (originally the oldest in Prince Edward County, built in 1829) was reconstructed as a Centennial Project. The original settlement of Marysburgh, 5th Township of Cataraqui, belonged to the United Empire Loyalists arriving in June 1784, but it was maybe Joseph Clapp and his lumber trading that gave rise to the first mill (now known as the Scott Mill) on Black River and hence the village of Milford. Milford is three miles up from Black River Bluff where the longest river in the County empties into South Bay. The dense forests of oak and fine pine gave it its name and choked it with fallen timbers, until Dr. Howey Bredin, Captain William Ellis, shipbuilder, and others decided that a "seaport" was needed and the river was cleared of logs and dredged to a depth of eight feet all the way back to Cole's Landing just south of the Mill dam. To level off the high spots in the river they used oxen and horses plodding along the banks towing scows with scoop shovels and ploughs chained to them. When they came to the county road winding around from South Bay to Waupoos, they rebuilt the bridge and its approaches, so that it could be run back on rollers to let tall masted schooners through. Horsepower was used to pull it over and pull it back. Beyond the village there was Cole's Landing and an ashery and a small soap factory shipping potash and soap. As H. Belden said of the County "the coastline being so very great in proportion to the area, and having so many splendid natural harbours along the shore, have given the farmers in this strictly farming community greater advantages as to shipping and marketing their crops, than can be found in any other part of Canada or of America. There is probably not a single farmer's barn in the whole County at a greater distance than seven or eight miles from a good wharf and storehouse; while the great majority have a half dozen such to choose from within less than half that distance." In the 1830's, as the Government built the Rideau Canal and promoted the development of trading, private schooner wharves were built along the banks of South Bay, and Port Milford became a settlement almost as large as Milford, three miles to its west. The Cooper brothers, James and William, established their store which served at least half the County, and Port Milford expanded rapidly during the "Barley Days" and when a cannery was later added to the local industries. Port Milford, noted in earlier years for its red mansions, stores, warehouses and schooners as well as its residents' reputation of industry and honesty, is not at the mouth of the Black River, but some miles south of the mouth in more sheltered waters. It is about 3 miles due east of Milford, facing the sunrise on South bay. Milford was a port of registry in the 1870's but not all the vessels registered there were built there, some were built at nearby Port Milford. There is not much doubt that Milford was the reason for Port Milford. In the 1800s and early 1900s Milford, Port Milford and the Black River were very much intertwined. All three places were involved in shipbuilding. The list of ships known to have been built within a few miles of the present site of the museum is quite extensive. The schooner "W.R. TAYLOR" built 1877 by George Dixon at Port Milford for Palmatier, Wilson and Collier. The first vessel to have been built at Milford was the Mary of Milford, a little schooner, put together with wooden pins or trenails, in the place of iron fastenings. The bank was so high where the Mary was built that they had to put her on sleighs for a mile around to the launching place. She was followed by the Ellen of Milford. Other vessels known to have been built in the area included: The schooner Morning Star (1868, Black Creek) of 5000 bushels, for Pat McMahon, and the schooner Hibernia, built at the mouth of the Black River by John Tait for William Ellis and Patrick McMahon, as was the Gold Hunter with a "100' keel of good white oak" and the Phinias S. March (year?, builder?). At Case's Wharf, at nearby Point Traverse, were built the schooners Plough Boy - built in 1863 and the L.T. Vorce (year?) both by John Tait, and the Prince Edward (year? builder?). At Cooper's wharf (Marysburgh, 1872) the schooner S.& J. Collier, named after two of the Collier brothers. The Garnet, propeller, was built at South Bay in 1889. On the beach at nearby Wellington was built the schooners Dominion, 79' long and 76 tons, register and the H.N. Todman for Horatio Nelson of that name. Many other vessels were built at Picton, Roblin's Cove, Coles Ferry, Rednersville, Consecon and other locations in Prince Edward County. Typical of the Quinte traders using Port Milford and South Bay was the Caroline which measured 105 tons. 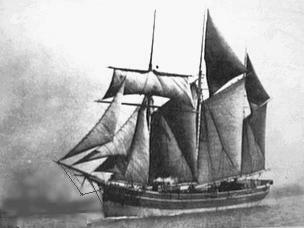 She was large enough to go to Oswego across the lake with profitable cargoes although she required seven men to sail her in those hand-powered days, and she was small enough to get into the little ports of Hallowell, Milford, Wellington and the Prince Edward County shore. Because of their close association with the lake, most South Bay farmers and their sons became very competent sailors. A high percentage of the vessels in the 100 years that sail dominated the Great Lakes and in those days too of steam, were manned or skippered by the boys from South Bay, and other nearby Prince Edward farms and villages. In the mid to late 1800's as many as sixty-four riding lights had been counted at one time as wind-bound schooners rode out westerly gales of Lake Ontario, off Timber island, into South Bay, almost in sight of the present Mariners Park Museum, in the lee of Prince Edward. It was from here that poor Moses Dulmage was blown across the lake in the Julia's yawl-boat from among a fleet of fourteen (? : Picton Gazette, November 15, 1878: "Thursday night, October 31, ten vessels, among which were the Julia, Olivia and Ariadne, lay at South Bay Point . . .") schooners and perished, on Halloween night, 1878. The "Ballad of Moses Dulmage" tells that tale about this local South Bay boy, as does the Ballad of "Nerva of the Delaware" tell the saga of Nerva McCrimmon, a South Bay girl aboard the vessel Dave Andrew which was built on Timber Island, and the "Ballad of the Belle Sheridan" tells of the terrible loss of the Belle Sheridan at Weller's Bay. We remember the many shipwrecks, and the tremendous loss of life that occurred off Point Traverse, Salmon Point, and along the South shore of the County, including Wellers Bay, in it's many storms during the development of Canada as a nation (At the close of 1883, no less than forty vessels and 672 lives had been lost on Lake Ontario) (from 1910 to 1922, Captain John Donnelly and his son Miller of the Donnelly Wrecking Co., salvaged 283 vessels sunk or stranded on the Great Lakes or Saint Lawrence River.) Today the area is a major attraction for divers from all over North America visiting the approximately 50 known wreck sites in the immediate area of the Mariners Park Museum. It is fast becoming known as known as the premier dive site in North America. The Mariners Park Museum is an important part of that attraction because of it's nearby location and outstanding collection of marine artifacts from the era of the great sailing schooners, and early steamships of the Great Lakes. The Mariner's Park Museum is much more than just an attraction for Divers. It is a significant show case of the maritime heritage which must be handed down to future generations. In all societies, the sailing vessel has been the instrument of progress. So it was on the Great Lakes. The sailing ships, following naturally behind the pioneers' canoes, were the agent of discovery and they were the harbinger of the development of Upper Canada. The lakes, rivers and bays that make up the Great Lakes chain were the highways, and the sailing vessels the trucks that rode on them. Ontario was very much a maritime province in the 1800s, and well into the 1900s. An important aspect of our heritage as Canadians is the story of our nautical past. The days of wooden sailing ships, the schooner days, are very much part of our heritage. In a very unique way Mariners Park Museum tells that story. A very competent staff under the direction of Curator Susan Stevenson, has created an outstanding educational display of our maritime heritage. Many hundreds of nautical artifacts of early vessels of the Great Lakes, both steam and sail, from papers, photographs, vessel models, early motors, various types of engines, deck houses, to early birch bark canoes (1700s), even a lighthouse, are displayed for "hands on" inspection and enjoyment. All this in an uncrowded park setting, overlooking South Bay. Mariners Park Museum, located in the gentle rolling countryside overlooking South Bay, is at the junction of County Roads 13 and 9 in the County of Prince Edward. Its location, close to the pioneer cemetery of South Bay where many of the early County sailors are buried, and the United (originally Methodist) Church which for many years has hosted a Mariners' Service in early August, is significant. More illustrations and images from the Mariners Museum and some general information. Production by Stormy Weather SoftWare Ltd.